The copyright police have forced us to remove our Clash T-shirts (turning rebellion into money anyone?) This is nothing to do with Mick, Paul, Tope but rather the corporate lawyers. 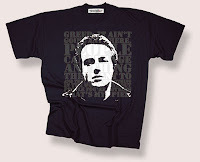 BUT we've found a fantastic new quote from Joe Strummer which they can't touch us for. Check out the new Strummer shirt. I've got my eye on another one, but if you're reading this on Monday morning Andy, I hope the celebratory hangover isn't too bad. Looks like Villa are Europe bound.